Skin cancer is becoming more common as we develop better diagnostic techniques, as our population ages and as sun exposure increases. Skin cancer often involves the skin of the eyelid or adjacent face. Indeed, sun exposed areas of the body are more commonly affected by skin cancer. They usually appear as painless lesions or nodules. There may be loss of eyelashes, ulceration of the skin, bleeding and distortion of the normal structure of the eyelids. When these findings are noted, they need to be evaluated and may require a biopsy to confirm the diagnosis. The most common types of skin cancer are basal cell carcinoma and squamous cell carcinoma. In general, these are painless elevated nodules that enlarge locally and rarely spread (metastasize) to different parts of the body. 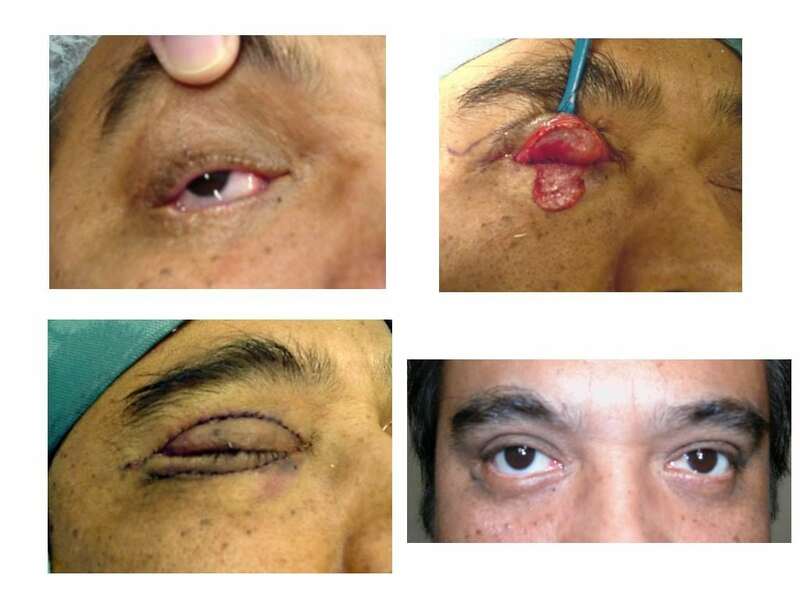 If not treated promptly, these lesions can enlarge to involve adjacent structures including the eye. There are several ways to treat these lesions including cryotherapy (freezing), topical chemotherapeutic agents, and surgery. Complete excision (with the aid of frozen sections or Moh’s surgery) of the lesion has been shown to be the most effective method of treatment. Once the lesion is excised completely, the resultant defect can be reconstructed with various reconstructive techniques. Sebaceous gland carcinoma and malignant melanoma are more rare than the above tumors and more serious forms of skin cancer. These tumors not uncommonly spread to adjacent and distant parts of the body. When these diagnoses are made, prompt aggressive treatment is required because of the threat of early spread.